Found this little mini-mask kicking around the studio the other day… it’s an oldie, probably circa 1997 or ’98. I used to offer these as brooches and pendants. Haven’t made one in forever and a day, and didn’t think I had any left! Finally got that soft light that I’d been hoping for, and made a dent in my “need to photograph” pile! This set can be found here, if you’re interested. 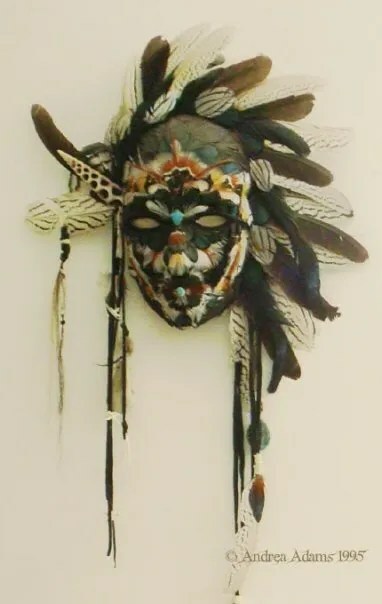 I designed this original leather mask in 2013. It’s part of an ongoing series that began in 2001 – each one is unique, but shares similar lines and details. It would seem that the design has recently been copied by another artist, who is marketing it as his own. Sadly, this stuff happens daily. If it was an isolated incident, I might be more able to let it roll off my back – but it’s not. It’s extremely frustrating, but I try to keep my mouth shut, because everyone tells me to take the high road. To “be better, not bitter” – and honestly, I want that too. Unfortunately, there are so many of these copycats these days that the “high road” is starting to feel like a lonely ledge… and it gets harder and harder to make a living doing what I love (or to love what I do for a living) from that place. This really hits me where I live, and I don’t know how to put a “positive” or “professional” spin on it. To my fellow aspiring artists, I cannot encourage you enough to be respectful of your peers (and yourself). Be honorable, be original, and don’t steal. This gallery showcases many (but certainly not all!) of the designs that I’ve done in this series. I hope it offers a sense of the time that spent honing and evolving these signature pieces. Many of these designs were commissioned to incorporate symbols or ideas that were personal and significant to them. Please be honorable, and respect my craftsmanship, my livelihood, and the wonderful people who’ve helped to support that process. 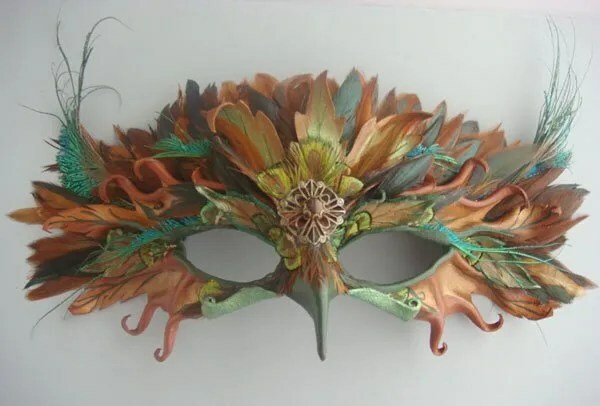 Leather peacock mask and crown. This piece is a work in progress. It’s a new iteration of my “Lady of the Leaves” design, which I usually create in either summer or fall colors. She was inspired by the first blooms of spring. When I shared this piece on my facebook fan page, and asked for suggestions for a name, “Lady of the Roses” was the one that I liked best. It fits well with the rest of the series … and I suppose that once she’s finished, I’ll need to create a “Lady of Winter” too. 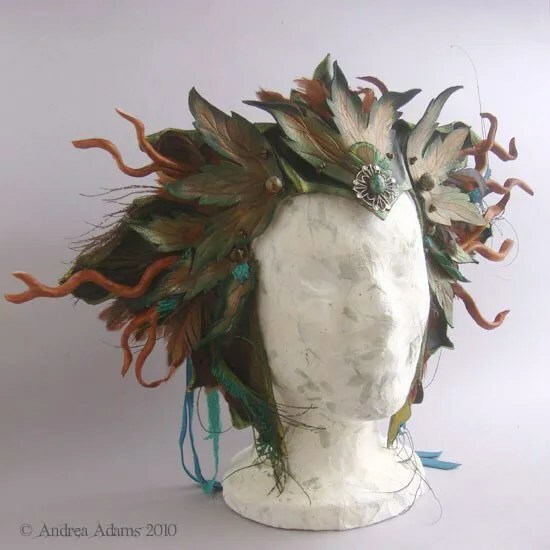 Artchain Day 2 – I was nominated by Mary Tafoya to post an item of artwork a day for 5 days (and to nominate others…). 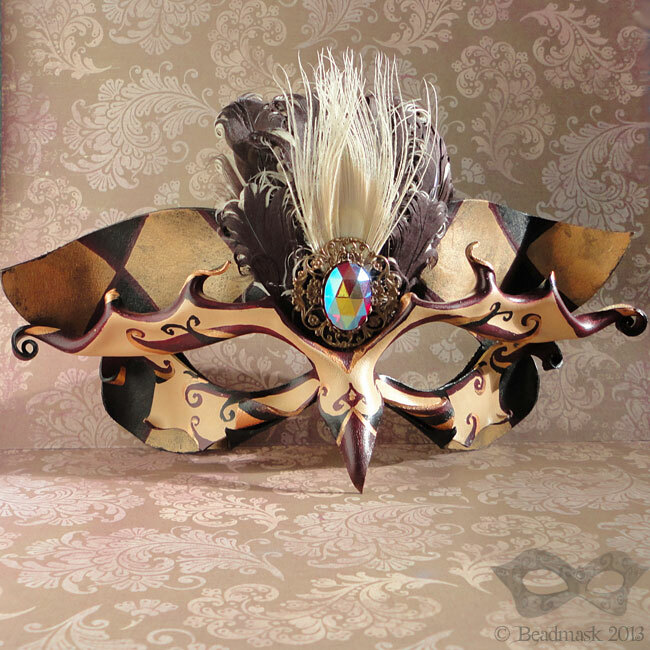 Here’s a more recent example of my mask designs. 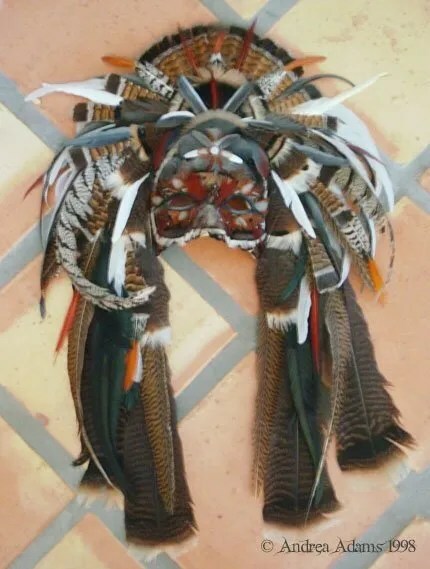 It’s a mask/headdress set (shown together and separately) that I did in 2010. Sculpted leather, peacock and pheasant feathers, vintage brass filigree + genuine turquoise & jasper beads and cabochons. Arthchain Day 1 – I was nominated to post an item of artwork a day for 5 days (and to nominate others…). 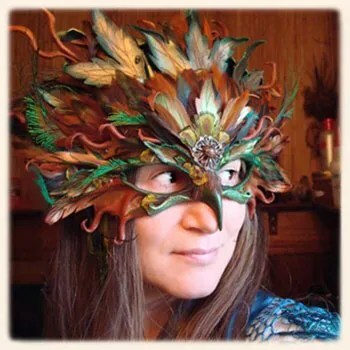 These are some of the oldest masks that I can find photos of (though they were made a few years into my mask making journey) and they’re quite different from what I’m doing now. 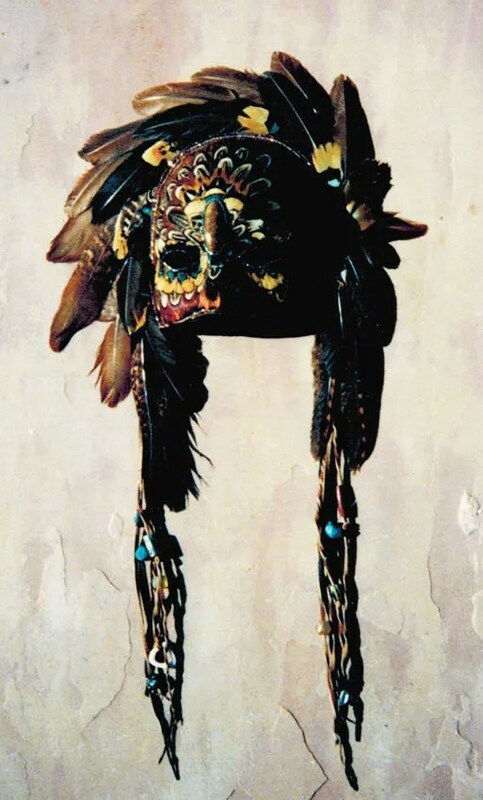 They used a lot more of the intricate featherwork, and though none of these really show it, but I used to incorporate a lot of detailed beadwork and gemstones too. They were made while my family and I were doing the pow wow circuit, and each one told a story about the people and places we encountered along the way. 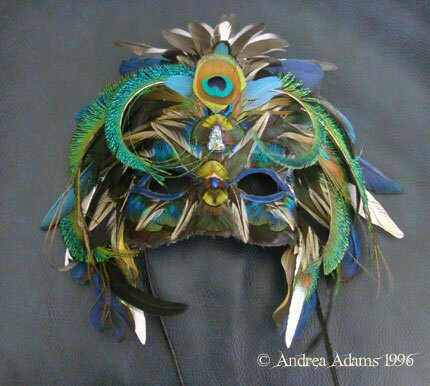 These would have been mid 90’s – just as I was transitioning from wallhanging/art masks, to wearable art masks. When asked for a bio, Aaron said “I’m not professional by any stretch of the imagination. I mainly just consider myself a tinkerer of sorts. I think since I’ve started about 2ish years ago I’ve really been trying to find a style of my own. Emotion is really what I’ve been wanting to convey in my mask making. 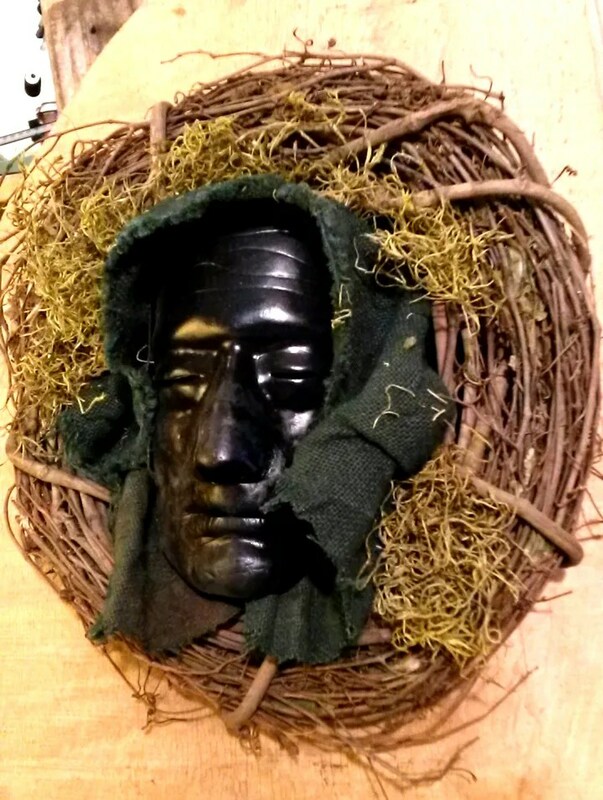 Like the one I made for the contest and I made another like it a while back called the crying mask. Really though, my collection of mask styles have been pretty diverse. I was enjoying making Mardi Gras or carnival masks just because they are outlandishly decorated and historically rich. He posted a very cool back story on this piece over on his DA page. 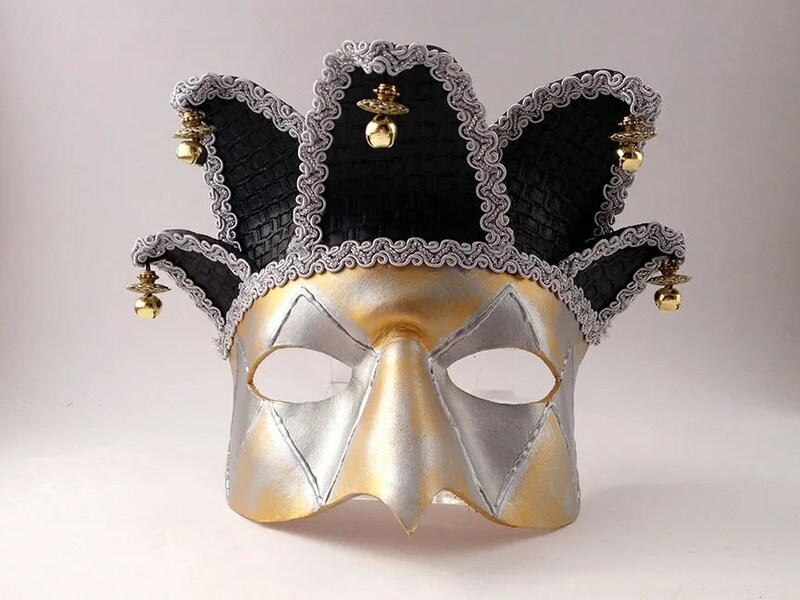 In the last few years, leather mask making has become wildly popular. What was once a fairly obscure craft is now a rapidly growing niche, with an abundance of newcomers. It’s great for the art form – new blood brings fresh ideas and energy, and established artists can pass along their techniques, ensuring that they won’t be lost over time. What’s not so great is that many hobbyists aren’t taking time to develop their own style before they start selling. Instead, they replicate established artisans’ work and sell the copies at discount rates alongside the originals. This practice is counter to the spirit of good craftsmanship, and it’s damaging to everyone involved: A flooded market decreases uniqueness, quality and value, and it confuses customers. Experienced artists are forced to compete with low quality copies of their own work (often priced at or below wholesale) and the copycats barely get paid for their materials, let alone their time. I’m really feeling the impact of this and sadly, I’m not alone. Some mask artisans no longer show their work online, while others have simply given up the craft in frustration. It’s hard to feel excited or inspired when your ideas and livelihood are copied before you’re finished exploring them. That may sound like a whole lot of whining, but really does go deeper than that. When talented artists stop showing their work or leave the field completely, it’s a loss for the whole community. While experienced artists are giving up, there’s an incoming crop of artisans that aren’t actually learning to create. They’re hungry for (and sometimes demanding) free tutorials and patterns, yet they seem afraid to experiment on their own. A critical facet of creativity is being willing to take risks and make mistakes. How will the art form grow if everyone just plays it safe and regurgitates what’s already been done? Let me clarify that I’m not hating on beginners. We all start somewhere. 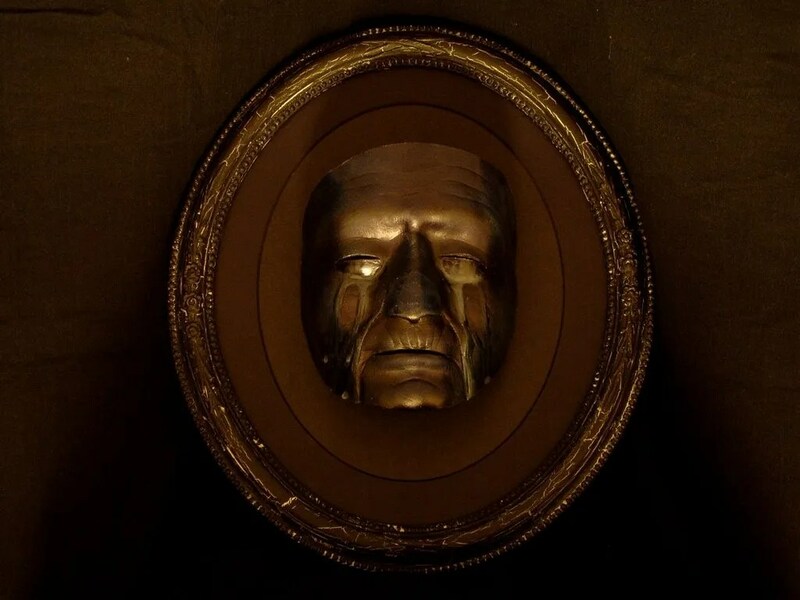 Some of the newer mask makers are creating outstanding work. They’ve used tutorials as a springboard for their own ideas, with innovative, high quality results. What’s more, they acknowledge their teachers, graciously showing appreciation and building community. With this mutually supportive approach, artisans of varying experience can build each other up and expand the art form. And why not? There’s enough room at the table for everyone, as long as we’re all being authentic and respectful. 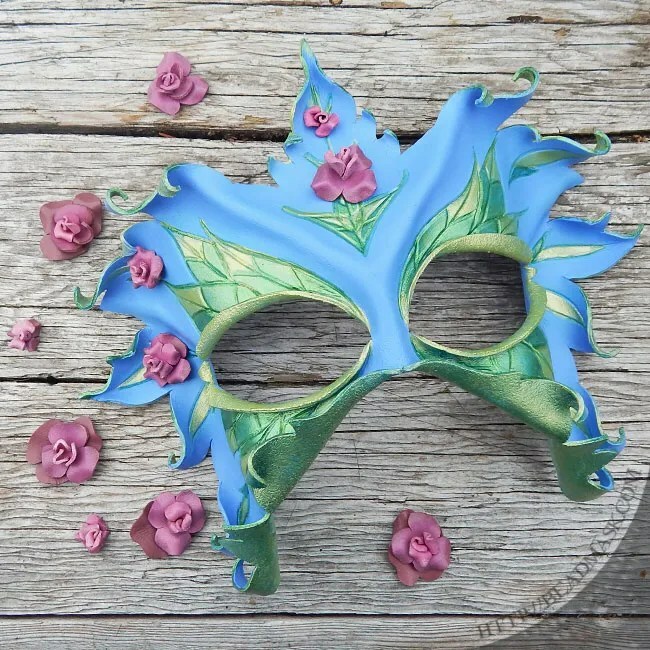 If you’re a mask maker, you’ve probably made (or will make) a dragon, skull, fairy, cat, owl, wolf or Anubis mask at some point in your career. This overlap is inevitable, but it shouldn’t be a problem if each artist is exploring these themes using their own vision and style. How do we foster a healthier community? Is it possible to share while still maintaining good boundaries? Is there a way to teach skills and techniques, while also teaching ethics and craftsmanship? How can we encourage people to refine their skills and personal style before jumping into the market? Likewise, can we encourage respectful competition? Please forgive the length, and know that I’m not out to preach or put anyone down. I’m sticking my neck out here in an attempt to spark discussion and positive change.